I never watched shows about any of the Transformers when I was a kid.Â I had a couple of toys which transformed and I thought that was one of the coolest things ever.Â I was pretty disappointed in the movie, but it had Michael Bay making the stuff blow up, so Iâ€™m not too surprised about that dislike.Â Yet for those of you who now have children, there is another chance for them to experience that sort of transformative magic on their television screens. 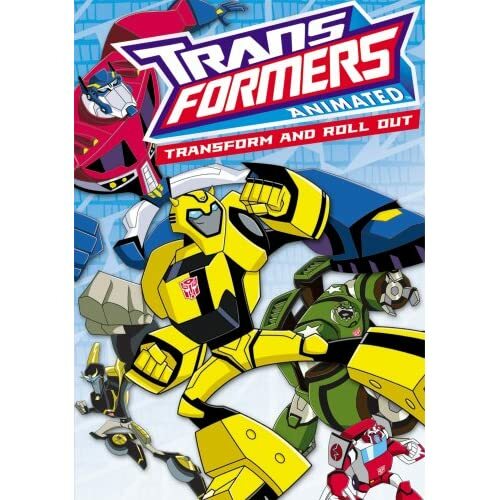 Starting this June 17th, now available for the first time ever on DVD from Paramount Pictures and Hasbro Properties Group comes the next chapter in the greatest robotic saga of all time.Â Transformers Animated â€“ Transform And Roll Out is now ready to transform your living room into a place of fun and incredible robots.Â Bring home this exciting hit show today! This show takes place in the future in a clean and economically successful Detroit.Â From that point alone we should be able to tell that this is science fiction.Â Optimus Prime and his group of Autobots have discovered the Allspark and are hiding with it deep inside of Lake Erie.Â The Decepticons are after them and the Allspark, so they must stay hidden.Â But they become accidentally awakened and must act to defend the humans from the evils of the galaxy, Detroit itself, and especially the Decepticons.Â Itâ€™s a classic and compelling tale of robots and their adventures. The special features included in DVD are two brand new animated shorts starring the Transformers themselves. Halfway through this DVD, I realized that I had actually watched most of this on television already.Â As I mentioned in another review, there is never anything on tv on the weekends, so I ended up watching cartoons again.Â This is a pretty good show.Â The graphics are good, there are some great characters and who canâ€™t help but to admire the heroic Autobots?Â Optimus Prime is a great hero and they will all make great role models and excellent distractions for your children. With this DVD, the good times will surely Roll. No user commented in " Movie Review: Transformers Animated â€“ Transform And Roll Out "